There has been significant discussion about the potential impacts of climate change on the world: more intense rainfall events, more severe thunderstorms and tropical cyclones, droughts, loss of glacial ice and storage, increased demand for crop irrigation. However for much of the State of Florida, and for much of the coastal United States east of the Rio Grande River, the climate issue that is most likely to create significant risk to health and economic activity is sea-level rise. Data gathered by NOAA from multiple sites indicates that sea level rise is occurring, and has been for over 100 years. About 8 inches since 1930. The impact of climate change on Florida is two-fold – Florida often is water-supply limited as topography limits the ability to store excess precipitation for water use during the dry periods and sea level rise will exacerbate local flooding. The highly engineered stormwater drainage system of canals and control structures has effectively enabled management of water tables and saltwater intrusion by gravity. The advent of sea-level rise will present new challenges, because the water table is currently maintained at the highest possible levels to counter saltwater intrusion, while limiting flood risk in southeast Florida’s low-lying terrain and providing for water supplies. As sea level rises, the water will not flow by gravity, which disrupts that balance struck between flood risk and water supply availability in the canal system. Occasional flooding is not new to Florida, but the increasing frequency we currently experience is related to sea level rise, not just along the coast, but for large expanses of developed property inland due to topography and groundwater levels. As a result, the challenge for water managers in the state, especially in southeast Florida, is to control the groundwater table, because control of the water table is essential to prevent flooding of the low terrain. The issue is not lost on local governments in south Florida nor on the educational institutions in the area. Florida Universities are studying the impacts to the region to identify ways in which we can mitigate, respond to and adapt to these changes. My university, Florida Atlantic University, is located in this vulnerable part of the State has been proactive in partnership with the Four County Compact in addressing these issues and we have now joined with other Universities in the State to form the Florida Climate Institute, a consortium working with state and federal agencies to address the multiple challenges and opportunities facing this State. FAU in particular, has been proactive in developing tools to evaluate risk and identify adaptation strategies to protect local and regional infrastructure and property. 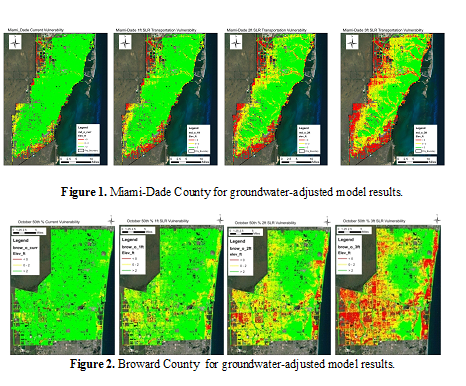 Our efforts have included using high resolution NOAA data to map topography at the +/- 6 inch level, combined that topography with mapping of infrastructure and groundwater, to identify vulnerable areas throughout Broward, Miami-Dade and Monroe Counties, as well as initiated projects in Palm Beach County and other coastal regions throughout the state. By identifying vulnerability based on sea level changes, the timing and tools for adaptation can be designed and funded to insure a “no-regrets” strategy that neither accelerates nor delays infrastructure beyond its need. While we have all heard the discussion of an estimated two to three feet if sea level rise is anticipated by 2100; sea level rise is a slow, albeit permanent change to our environment. The slow part allows us to make informed decisions about adaptation strategies that may prove useful in the long term as well as the short term. Of prime importance is the need to plan for these needs 50 or more years out so that we do not increase our exposure to risk. Keeping development out of low lying areas, redeveloping pumping and piping systems with change in mind and reserving areas where major efforts will need to be undertaken, is important to the public interest and will affect private business, tourism and homeowners. Sea level rise is already a problem for many low lying areas such as Miami Beach, Fort Lauderdale, Hollywood, and other coastal communities. It will be an incremental problem creeping up on us for the rest of the century and beyond. The lowest lying areas are the roadways, which are also the location of electrical, water, sewer, phone and drainage infrastructure. Fortunately given the current Federally funded special imagery and NOAA data systems we are able to predict pretty accurately where flooding will occur. Linking that information with detailed projections of sea level rise impacts we can map vulnerable areas and build adaptive measures into every action and plan we undertake. But the impacts are not only on the coast. Sea level affects ground water table levels and with our intense rainfall areas far inland can be flooded, even subject to long term inundation. Water levels are rising and will continue to rise as groundwater rises concurrently with sea level. Add the impact summer rains and dealing with water becomes a major priority. Figures 1 and 2 outline the roadway network degradation at present, 1, 2, and 3 ft of sea level rise. The figures demonstrate that a major, underestimated amount of property is vulnerable on the western edge of the developed areas because the elevations are decreasing as one moves west from I95. In the worst case retreat from the change. Retreat does not need to be considered in the short or medium term. South Florida has developed in the last 100 years and there will be well over 100 years of life left. As a result, the best option is adaptation. Adaptation takes different forms depending on location. I have developed a toolbox of options that can be applied to address these adaptation demands, resulting in an approach that will need a more managed integrated water system, more operations and inevitably more dollars. For example we can install more coastal salinity structures, raise road beds, abandon some local roads, increase storm water pumping, add storm water retention etc. to address many of the problems. The technology is available today. Much of the actual needs are local, but the problem is regional and requires a concerted effort of federal, state and local agencies and the private sector to address the scales of the problem. A community can address the local problems, but the regional canals, barriers, etc., are beyond the scope of individual agencies. Collaboration and discussion are needed. The needs will be large – in the tens of billions. But there are two things in south Florida’s favor – time and money. The expenditures are over many, many years. Most important in the near term need is the early planning and identification of critical components of infrastructure and policy needs and timing for same. That is what FAU does best. At risk are nearly 6 million of Floridians their economy and lifestyle, $3.7 trillion in property (2012) in south east Florida alone and a $260 billion annual economy. All of these are expected to continue to increase assuming the appropriate plans are made to adapt to the changing sea level. Protection of the area for the next 100-150 years is achievable as long as we have the science, the understanding and the will to do it. Plan now, and over the rest of this century starting now we can raise those billions of dollars needed.